Most my resolutions this year were professional ones. I’ve given up on any kind of “getting fit” or “be Martha Stewart in my spare time” resolutions. The more I resolve, the less I do. It’s my contrary brain. I’ll do it when I’m ready to, and not a moment before. Conveniently, I was ready to change baby storytime right as the new year came around so now it became one of my new year’s resolutions! Since today was so successful… this New Year’s Resolution is DONE! Basically, I spent a couple hours on Jbrary’s youtube channel finding some rhymes and songs that are perfect for me. Part of what I love about their selection is there is something for everyone. Every storyteller has their own style and Jbrary has something for everyone. Other songs and rhymes included here came from the WCCLS website and KCLS Tell Me a Story. The words to the rhymes and songs mentioned here can be found on the Rhymes page (only the first time they occur on the blog are they written out in posts). Happy New Year and welcome to baby storytime. My name is Kendra. We will be learning some new rhymes and songs today and the words to them are taped on the wall behind me. Feel free to use those as a “cheat sheet” during storytime, but we will also repeat songs several times in order to learn them. Part of the reason I put the words up on the wall is to help your babies start understanding that these squiggles and things they see actually have meaning. If they see you looking at the words, they know they are important and will be interested in them because you are. I’ve added verses to this simple song to turn it in to a name game. Hi, hello and how is Jack? How is Jack? How is Jack? How is Evelyn? How is Suzie? Hi, hello and how is Robert? A rough road, a rough road, a rough road, a rough road, A HOLE! 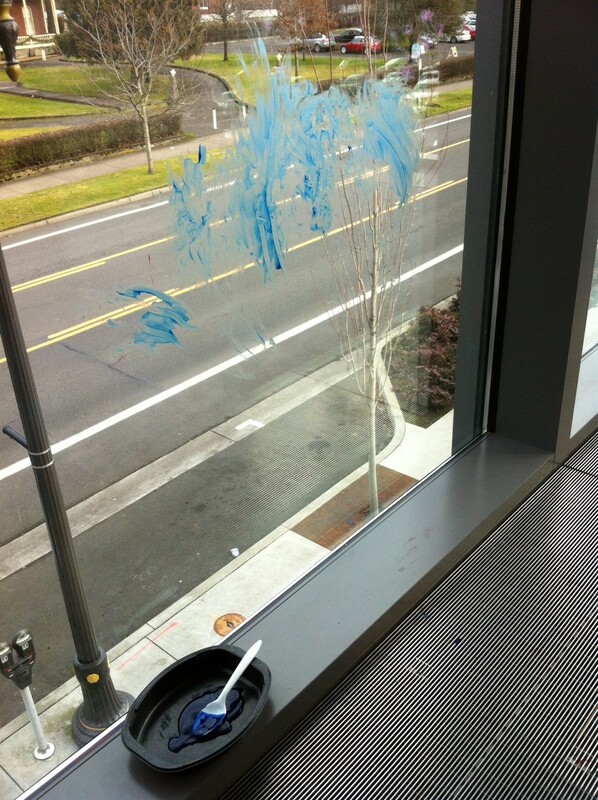 Activity: Finger paint on the windows. Not a lot of babies participated, but I had great conversations with all the caregivers about sensory development and ideas for things like this they could do at home with their babies. One of the standers had a LOT of fun.